David Bowie is undoubtedly one of the biggest entertainment legends of all time. Both as a singer and as an actor, Bowie had built a fanbase consisting of millions as his star shined brightly in everything he did. Truly one of a kind, fans have been mourning Bowie's death since the legendary rocker left us in 2016. But while Bowie may not be here in person, his impressive legacy will forever live on through everything he's given us. To help remember the musician's unique life story, the upcoming movie Stardust will touch on Bowie's life early into his music career, set in the early '70s. 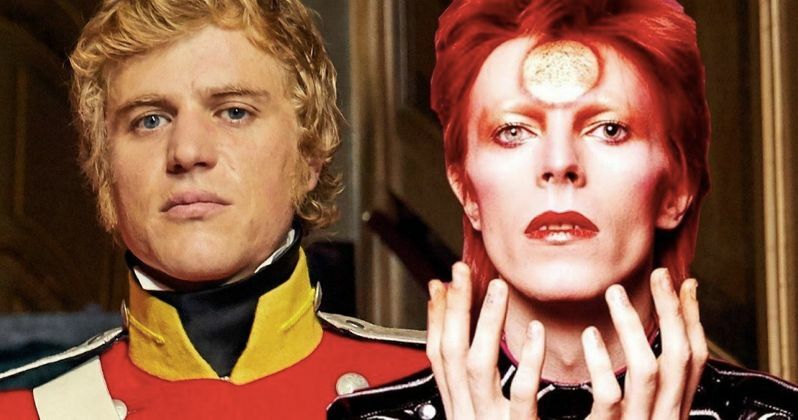 Additionally, musician and actor Johnny Flynn has signed on to appear in the movie as Bowie himself. The movie comes from Film Constellation, which begins world sales next week in Berlin. Set in 1971, the movie's plot will focus on David Bowie as a young musician and his first trip to the United States. Huge fans of the singer will know this is was what inspired Bowie's alter ego, Ziggy Stardust, which is a name almost just as iconic as Bowie's real name. Experimenting with his music and appearance as the flamboyant Ziggy Stardust character helped establish Bowie's identity in the entertainment industry. This led to his single "Starman," which reached tremendous success and is considered a milestone for Bowie's career. On the big screen, viewers will be able to see the story of how the singer went from a budding musician to one of the most memorable and beloved entertainers of all time. Further casting for the movie is under way. However, other names have been attached to the cast in addition to Johnny Flynn. Jena Malone (The Hunger Games) will play Bowie's first wife, Angie, who was married to Bowie from 1970 until 1980. Marc Maron (Glow) has also signed on to play Bowie's record company publicist. As casting continues, more names will likely be announced to join the project soon. Also revealed is the obvious inclusion of some of Bowie's performances into the soundtrack, but this will be in addition to other popular songs from the era. I Am Slave director Gabriel Range will direct the movie, using a screenplay by The Last Czars writer Christopher Bell. This will oddly be the first biopic for Bowie, whose life story has practically demanded one for years. Filling Bowie's shoes is going to be a tall order for any performer, but the same could also be said for Freddie Mercury of Queen. The recent success of Bohemian Rhapsody shows that people want to see movies about the true-life stories of legendary musicians, and Rami Malek has been universally praised for his performance. Assuming the role of Ziggy Stardust will definitely be challenging for Flynn, as it would any actor, but Stardust could potentially turn out to be just as big of a hit itself. Shooting is set to begin in June 2019. No official release date has yet been attached to the project, but more updates will be hitting the headlines as we move forward to principal photography. In any case, there's certainly enough here for David Bowie fans to start getting excited. This information comes to us from Deadline.